No one wants to see a snake in or around their chicken coop. Large snakes can consume eggs, and even kill and eat your live chickens. If a venomous snake gets into the coop, you or one of your chickens could wind up suffering from a bite that requires medical treatment. The more time and effort you spend preventing snakes from entering your coop, the safer you and your birds will be. Snakes do not have legs, but that does not stop them from crawling into your chicken coops. Snakes can fit through any cracks or holes in the walls, floor or roof of your coop that are larger than 1/4 inch. If your coop features an outdoor run, snakes can get in by going underneath the fencing, through the fencing or even over the fencing. The U.S. Geological Survey recommends filling in all holes that are larger than 1/4 inch to keep snakes out of a building. Holes that can not be filled need to be covered with hardware cloth or another type of sturdy mesh with mesh less than 1/4 inch. Cover holes or gaps in the walls, windows, skylights and the entire fenced, outdoor area of the coop. You can not use too much hardware cloth when you are trying to protect your birds from snakes and other predators. In addition to running hardware cloth over the openings in your coop, you can also create an "apron" around your coop by placing wire mesh underneath the coop. When you build a coop apron, make sure that approximately 12 inches of wire extends out from underneath all sides of the coop to create a barrier against snakes. A multi-faceted approach to keeping snakes out works best. Mow the grass in your yard and around your coop regularly. Short, well-maintained grass provides snakes with fewer places to hide than tall, thick grass. You also want to keep debris, rocks, wood and brush piles away from the sides of your coop so that snakes will not have a convenient place to hide near your coop. Cut down tree branches and vines so that snakes cannot climb them and enter your coop from above. Snake traps can be purchased and set out in the area surrounding your coop to trap snakes that may be living nearby. You can also try commercially-available snake deterrent products, though the Humane Society of the United States states that none of these products are specifically proven to work in a humane manner. Additionally, poisons and chemical agents may harm your chickens, so discuss any potential deterrent products with your veterinarian before you purchase and use them. Snakes enter your chicken coop because they are looking for any easy meal. 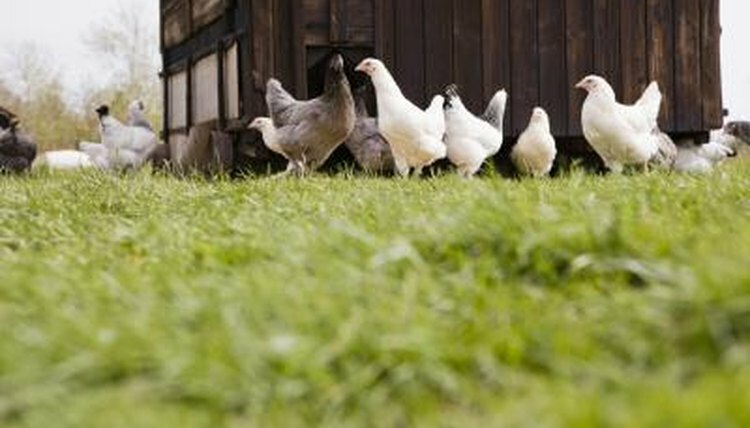 Do not leave chicken feed, eggs or any other type of easy snack inside the coop after dark. Easily-accessible food sources attract snakes and other predators. Remember that snakes are attracted to any type of potential meal; if you have a rodent problem in your coop, snakes may be just as attracted to the rodents as they are your chickens, so take care of any rodent or pest problem within your coop. If you do see a snake in your coop, have a professional remove it for you and dispose of it.